"Right from the opening words, readers will find themselves glued to this fact-filled foray into the fine art of forensics." "This readable book is a fine example of the application of scientific knowledge to the 'real' world." The book follows Dr. Charney who describes the mystery, the mental and physical processes of discovering the truth about recent murders or historic personages ranges from the Iceman to Jesse James." "Show kids a full-color cover photo featuring shelf upon shelf crowded with skulls, and you're certain to get their attention. The rest of the book won't disappoint, either. 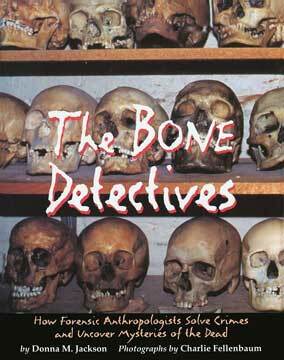 Jackson follows forensic anthropologist Dr. Michael Charney and his colleagues as they solve an actual case by developing a physical profile from bones and teeth, reconstructing the victim's skull, and using clues from fibers and other material to make further identification…"
A New York Public Library "100 titles for Reading and Sharing"
Pennsylvania School Librarians Association "Best of the Best Top Ten Books for Yound Adults"
Alabama Emphasis on Reading Award.